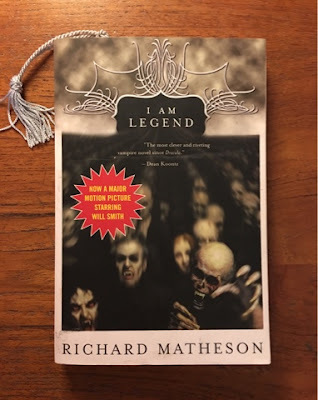 Having previously never read I Am Legend, I thought now would be an opportune time, especially in the current socio-politic state of the world. I'm very glad I did because it was a very eye-opening, educational and thought provoking read. I Am Legend was written in 1954 if you can believe it, making it 63 years old. And it's as remarkable today as it was then. Perhaps even more so, because it doesn't feel like Science Fiction, it feels more like a possibility. Forget what you've seen in the classic 1971 film adaptation The Omega Man, a very interesting example of social commentary in its own right, but nowhere near as revealing as the book. However, it seems as though the part of lead character Robert Neville was created for Charlton Heston, as he is described exactly as we see him in the film. Forget the 2007 version starring Will Smith too, which has its merits, but gets lost in so much CG and over-the-top action just to keep the modern day viewers interested. This story needs none of that. It is simple, straightforward and believable in that if you thought you were the last person - human being that is - on Earth, what would it do to your state of mind, and your ability to survive? The last third of this story is gripping and devastating. We witness Robert Neville lose the last shred of hope, accept his fate and realize just how little man has evolved. And for us, 63 years later, it's sobering to think that we are more like the 'vampires' in the story than anything else. As a result, I'm more than a little sad, but also in awe of Richard Matheson's insight into humanity, and his ability to articulate such a poignant, and shockingly real view of human nature and our own potential destiny. Are you thoroughly depressed now? Maybe this will cheer you up... There are several other stories in this anthology, but there is one called Prey which I'm pleased to report is the original story which became the final segment in the 1975 made-for-TV anthology film Trilogy of Terror starring Karen Black. Richard Matheson himself wrote the teleplay along with William F. Nolan which stands to reason why this adaptation is exceptionally faithful to the original story. And a real treat. Like this edition? You can purchase it here and I will receive a penny or two for your referral!